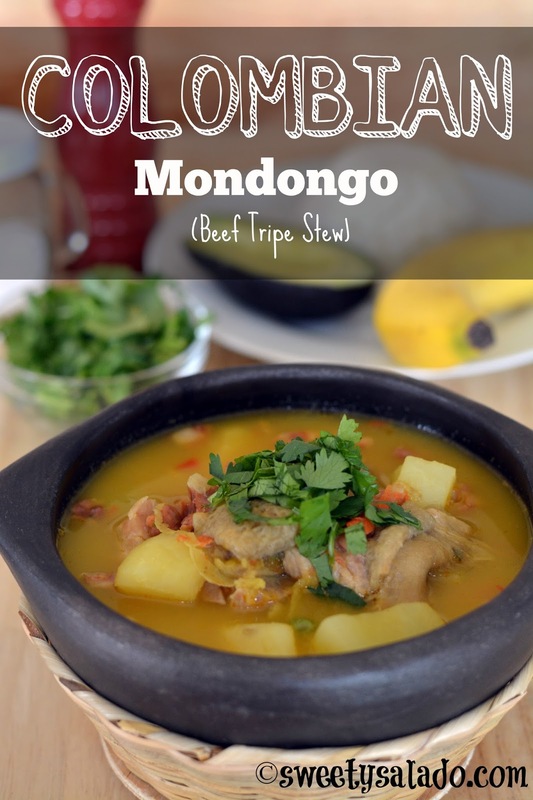 I still remember the first day I tried Colombian mondongo (beef tripe stew). I think I was 7 or 8 years old and my mom told me that she had made it for lunch. When she served it, I didn’t want to eat it and not for the reasons you might think, but mainly because I had no idea what the pieces of meat that were floating around in my soup were. Then, with all the patience in the world my mom grabbed one of those funny looking pieces and said: “This is mondongo. Look, it looks like a piece of towel. A tiny towel.” And with that, she convinced me to eat it. 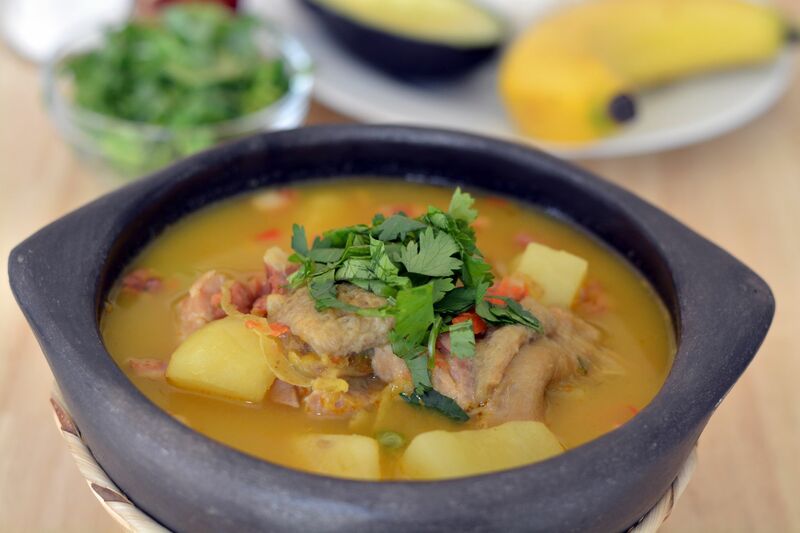 The soup was not very elaborate but I remember that it did have cassava or yuca, which I have loved since I was a kid. Then, as time went by I realized that a great mondongo should have all kinds of ingredients, pork meat, vegetables, potato, cassava and the best part, Colombian sausage. The Colombian sausage is key for a mondongo to come out amazing, and even though it can be optional, I highly recommend you add it. The beef tripe I find here in the US is usually frozen, and that’s only if I’m lucky enough to find it at all. And even though it comes completely “clean”, I can still smell that strong and particular odor. That’s why I clean it really well under cold running water, for at least five minutes and then I drench it with lemon juice. Some people may say that that is a bit much, but it’s the only way I can convince myself that it is 100% clean and disinfected before eating. Rinse the beef tripe really well under cold running water. Place it in a container, cover it with water and add the baking soda. Cover it and store it in the refrigerator for at least 2 hours or overnight. The next day, rinse it again with cold running water and cover it the lemon juice if you want, then rinse it once again. Place the beef tripe in a pressure cooker with plenty of water to cover it and the two green onion stalks. Cover the pressure cooker, bring to pressure on high heat, then reduce the heat to medium and cook for 1 hour. If using a regular pot, bring to a boil on high heat, then reduce to medium and cook for 2 hours. Once the beef tripe is cooked, release the pressure completely, uncover, drain the mondongo, let it cool and chop it into pieces. In a large pot, heat the oil over medium heat. Add the white onion and cook for 3-5 minutes or until translucent. Then, add the green onion and the garlic and cook for 1-2 minutes. Now, add the chopped tomatoes and cook for 3-5 more minutes or until they soften. Add the 8 glasses of water, pork meat, sausage, mondongo, cumin, color and chicken bouillons. Cover and bring to a boil on high heat, then reduce to medium and cook for 30 minutes. Now add the russet potatoes, cassava, papa criolla, green peas, carrot and season with salt and pepper to taste. Cover and bring to a boil on high heat, then reduce to medium heat and cook for another 30 minutes or until the potatoes and cassava are tender. Serve in individual bowls, decorate with chopped cilantro and serve with white rice, avocado and a banana.